First, I have to apologize for not getting the new blog roll done today. I would say the devil made me NOT do it, but I suspect you wouldn’t belive me. I will try to get around to it tomorrow, but I shouldn’t make anymore promises I can’t keep. I did want to list a few websites with good info and technique on how to create a bondo transfer. Some of these websites even have information on sculpting the piece as well. The last one is an excerpt from a book, but it does have the necessary info so I thought I would throw it in for good measure. I figure, there’s more than one way to skin a cat (or do other things less violent and anti-kitty). It’s best to learn different methods and then see which one works for you. 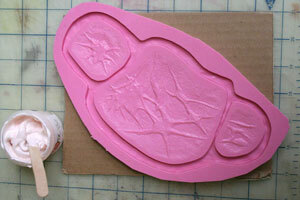 I learned how to make bondo transfers in school. When I went through the process again for this blog, the first set came out a little gooey. It was because I didn’t make the paste thick enough. I added more Cab-O-Sil to the mix and the next set worked just fine. 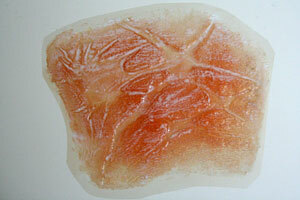 If you have tried a bondo transfer, let me know, I would love to hear from you. Now I have to figure out how to make a set of horns for a devil makeup I am applying next week (see, I wasn’t lying about the devil thing earlier!). Let’s hope they come out better than the first set of transfers.